Former Tallahassee mayor Andrew Gillum will join Harvard University as a resident fellow at its Kennedy School’s Institute of Politics. 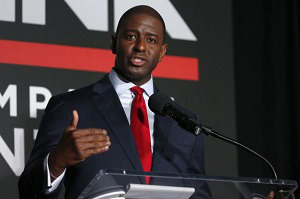 Gillum, who previously lost to newly elected Gov. Ron DeSantis in the 2018 Florida gubernatorial race, will be joined by nine resident and visiting spring semester fellows. The other visiting fellows include former Republican U.S. Rep. Carlos Curbelo, who recently lost his South Florida seat and U.S. Sen. Heidi Heitkamp, a Democrat who recently lost her North Dakota seat, according to Florida Politics. The resident fellows will “reside on campus, mentor undergraduate students, hold weekly office hours, and lead an eight-week, not-for-credit study group on a particular subject according to their experience, interests, and expertise,” the school said. Mark Gearan, director of the Institute of Politics, said the program is crucial to the Institute’s mission. “We are eager to bring together this extraordinary group of fellows who will provide students with the opportunity to learn from their experiences running for office, building grassroots advocacy campaigns, and making public policy,” Gearan said.